On July 12, 1986, I was visiting Mom's sister, Aunt Pearl, in Hot Springs Village, Arkansas. We were sitting on the porch in back of her lovely cottage in the pines. Flanked by a beautiful lake, we were surrounded by twittering birds and playful squirrels. I'll never forget it. Aunt Pearl was crocheting and I was watching her hair with the afternoon sunlight playing on it. I wrote this poem for her. The silver comes from a Pearl. 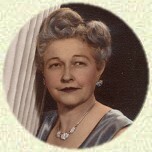 Jennie Lou's mother, Katie Ezell King, was the youngest child in the Ezell family.